Most venoms are mixtures of dozens of compounds, and the active toxic ingredients are proteins that wreak havoc on the recipient in a variety of ways. While the exact enzymes vary from species to species, and even geographically within a species, many snake venoms contain some sort of neurotoxins which block signals sent through your nervous system, leading to numbness or even paralysis. 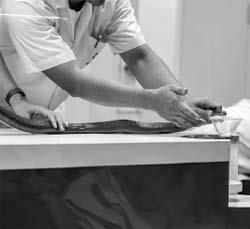 An expert extracts venom from a snake, which will later be used to create antivenom for snake bite victims. Snakes can have different types of venom: neurotoxins or cytotoxins. Neurotoxins work by blocking nerve function, while cytotoxins destroy cells directly.